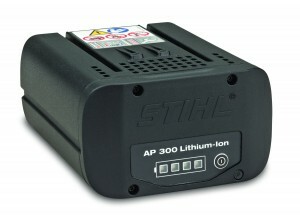 Stihl ramped up its lithium-ion battery line with the addition of its AP 100 and 300 batteries. At 1.8 pounds, the Stihl AP 100 produces the same energy content and run times with 31 percent less battery weight than the previous model, the Stihl AP 80, according to the manufacturer. As well, the Stihl AP 300 produces 28 percent more energy content while remaining the same weight (3.8 pounds),as the previous model, the Stihl AP 180. Both the AP 100 and 300 batteries are compatible with the full line of Stihl battery products and, like all Stihl batteries, feature an onboard circuit board to monitor voltage and temperature. LED charge displays also allow users to monitor how much power they have as they work.